It was fifty years ago today- October 9, 1968- the Detroit Tigers evened the World Series up at 3 games each- forcing a Game 7 by smashing the St. Louis Cardinals 13-1. The Tigers brought back Denny McLain to pitch on 2 days rest and in his third start of this series finally pitched well- going all the way and only giving up 1 run. 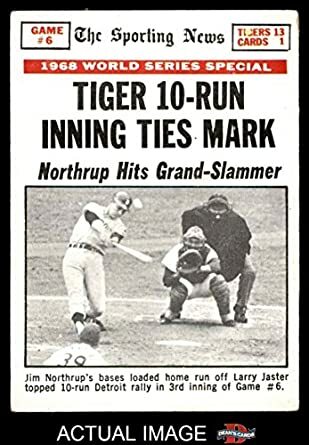 But the story was the Tiger bats- they scored 2 in the 2nd inning but exploded for 10 runs in the 3rd inning- tying a record for the most World Series runs in one inning- and then cruised to a 13-1 win. The hitting heroes for the Tigers came from the meat of the order- Al Kaline having a great series went 3-4 with 4 RBI, the clean up hitter Norm Cash 3-4 2 RBI, 4th hitter Willie Horton 2-3 2 RBI and 6th hitter Jim Northrup 2-5 4 RBI his 4 RBI’s came on a Grand Slam. Cardinals pitcher Ray Washburn gave up 5 earned runs in 2 innings- in all the Cardinals used seven pitchers. The 1968 World Series which the St. Louis Cardinals at one point had a commanding 3 games to 1 lead would now come down to one game. Tomorrow the Tigers bring back Mickey Lolich who has won his two starts in this World Series against Bob Gibson who has been dominating giving up only 1 run in 18 games in winning his two starts. Can’t wait to see how it turns out 😀 and to read your summary!